Bitdefender is one of the upcoming Antivirus working hardly for the number one place rather we can say that if you will see the top 10 rankings on many sites it has already acquired the top rank followed by Kaspersky. If you will see our Top Ten Antivirus rankings it has acquired the number eleventh place however that is based only on the traffic on their website. 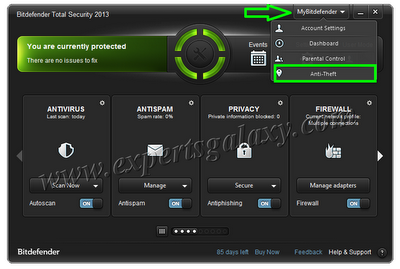 Yesterday, they released the final version of their 2013 versions with many extra features and the good news is you can get a Bitdefender Total Security 2013 free for 90 days by liking their Facebook page. In the past we have arranged many giveaways for Bitdefender Antivirus, even currently we are running a combo giveaway for Bitdefender & Zemana Antilogger. Mainly, they have three products to choose from and you can get one month trial for either of them but here is a chance to get a 3 months trial for Bitdefender Total Security 2012 under a time limited Facebook giveaway. To get your free trial for 3 months simply go to their fan page below and like it. 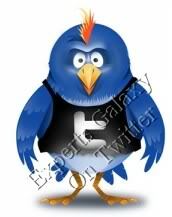 Like the page and then download your 90 days free trial for the best product from Bitdefender. It is an online installer that you get from the page, simply download and install the product to get your 90 days free trial. I wish they would have provided the Bitdefender offline installer for the promo version but I can understand that its not feasible for a promo build that changes frequently. 1 ) They introduced a feature called Bitdefender Safepay, whenever you will open a banking website it shows a pop up as shown below to use this feature a sort of protected mode somehow similar to Kaspersky`s Safe Run. When I tried to open my bank`s website, out of 4 I could successfully login to only 1 bank account and moreover Keyscrambler doesnt work with it, so I will better stay with normal browser login. However they say that its the most protected mode for online banking securing the user from all kinds of keyloggers, you will also see a desktop shortcut to launch this feature once your installation for the software gets complete. 2 ) USB Immunizer is a very good free tool from the developer which they have included in all their 2013 software versions. It automatically disables the autorun threats before they can infect your computer. It monitors all devices that you plugin to your computer, if any infected device will be plugged in which is not immunized then also it will not execute the malware residing in the drive. It appears when you right click a USB device connected to your computer. 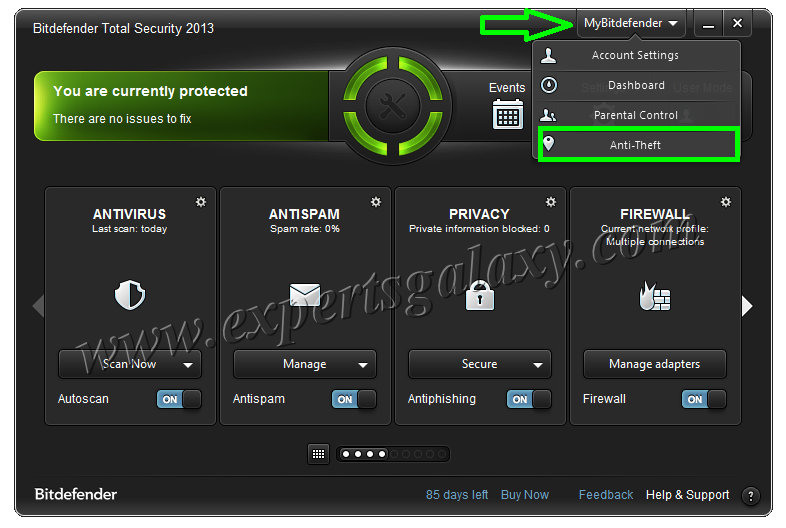 Once you have created the account just click the Anti-Theft option under MyBitdefender as shown below to use the feature and sign in to your Bitdefender account. It will open your account in the browser with the Anti-Theft options, you can create a password to lock your computer and can use the same incase it gets stolen as shown in the image. 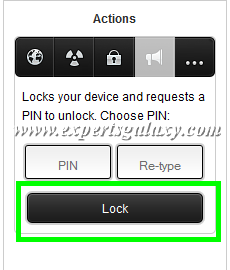 Whenever you will click on lock option the computer will restart at the remote location ( it displays the location using Google maps ) showing a black screen asking for the password, after typing the correct password only one can sign in to the computer ( you can test this feature like me but dont try the option to wipe your data untill you are using a test machine ). Overall the new family of Bitdefender products is an improved one and older readers are aware that along with Kaspersky its the most recommended security software.